Should organizations have a different strategy to improve employee engagement strategy when turnover is high? For some businesses such as cleaning services and fast food restaurants, it’s common to see up to 90% employee turnover within 9 months or sooner. This is not because there is something wrong with these organizations. Rather, these mostly minimum wage, part-time workers may be in the process of completing their education, or possibly looking for jobs offering better pay, full-time work, or more opportunities for growth. Consider this strategy to help improve employee engagement levels in organizations with high turnover rates. Should companies with a large number of part-time, temporary workers even be concerned about trying to improve employee engagement? Yes! Improved levels of workforce engagement, for all workers, can provide great benefits to your company, but different motivational efforts should be used on each segment of your staff. Think of your employees as belonging to two groups. The first is your part-time, more transient staff, while the other group is your leaders and managers. Onboarding: Concentrate on an effective, but short onboarding process that quickly brings new hires up to speed on their job, your procedures and your culture. Make them feel part of your family. Instructions should include “What to do” and “How to do it”. If additional training is needed, make it quick and easy. Handbook: Provide each with an employee handbook, and an easy way to get answers to common questions about their job. Paying the most that you can afford will help to keep these employees a little longer. Recognition is extremely important for this group: They work odd hours, and may not be known to management, but play a vital role in your business. Everyone craves recognition, so use every opportunity to let them know how much they are appreciated. A sincere “Thank You”, a compliment, or a public recognition award will show that their work matters, you noticed their efforts, and care about them. 2. For your leaders and managers, these tips to improve engagement levels will provide a more significant return on investment. Help them see the potential return on the investment of their time in your business. Show them a defined career path detailing how they can grow within your organization. Empower your leaders with the education and the authority needed to make a difference. Concentrate on the skills needed to become good listeners and good leaders so they can motivate others to do the best jobs possible. Help them understand that, as leaders, their role is to create an environment that enables and inspires their staff to make a choice to be engaged. Recognition is also very important for this group. Include various incentive and recognition components - all working together to help your leaders feel appreciated, motivated, and be more engaged. Segmenting a workforce with high-turnover rates, and then concentrating on the things that work best for each group, will help improve everyone’s commitment to the organization and their jobs. The resulting higher engagement levels will help improve your organization in many ways, including your bottom line. Select-Your-Gift Employee Recognition can help! 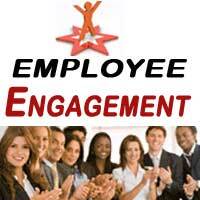 Let us show you how we can help your organization improve Employee Engagement through Employee Recognition. Solutions range from a comprehensive online Points-based program, to easy-to-use Gift of Choice award catalog packets.